As a founding member of Staten Island's Wu-Tang Clan, it's not an overstatement to say this is a man who changed the game. 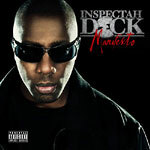 Now straight from the slums of Shaolin, Inspectah Deck is back with Manifesto, his best solo effort to date. Long regarded as one of Hip Hop's most gifted MCs, Deck is joined on Manifesto by Raekwon, Billy Danze of M.O.P, Termanology, Cormega, Kurupt and many more. Now is the time for Inspectah Deck to deliver truth to the world of Hip Hop. This is his Manifesto.